"Momma, you run fast!" Ella yelled from the sidewalk where she was riding her blue Cinderella bike in a pink dance leotard with its gauzy pink skirt billowing up in the wind as she rode. Her long brown hair fell in strands from beneath the clunky purple bike helmet and the sun shone brightly on her cheeks as she squinted to holler her assessment of my "run". I almost choked on my saliva as I laughed aloud and smiled back at her from the street where I was pushing the jogging stroller with the baby belted in, squawking because she wanted to get out. My plodding trot as I pushed the bulky stroller didn't feel much like the "running" I liked to picture myself doing. "Thanks babe!" I replied enthusiastically. This particular morning was beautiful, sunny and springy. The last several weeks had been so hectic with preschool graduations, gymnastics, Scott's work schedule, family commitments, church commitments, social commitments and school stuff that fitting in even a 1/2 hour run had becoming increasingly challenging. Exercise has always been an important part of my life. It helps to maintain my sanity (there is actual medical proof to support this!) and even in the wake of having one, and then two children I've always been able to fit it in at least three times a week because I've made it a priority. Lately, priorities seem a little hazy. Or at least covered in crushed cereal puffs, diapers, apple sauce mashers and figuring out where those darned bins of shorts are that I put away seven months ago, in a nice safe place, to be pulled out for the children when the time was finally right. Fortunately the weather has improved in Buffalo and I can get outside to run, but it's usually at 7:30 at night when I'm very, very tired and feel twice my age as I plod heavily down the street. So on this particular morning I thought, Well, Ella is perfectly capable of riding her bike and Aubrey is old enough to fit into the jogging stroller, let's give this a try. I'll be honest. 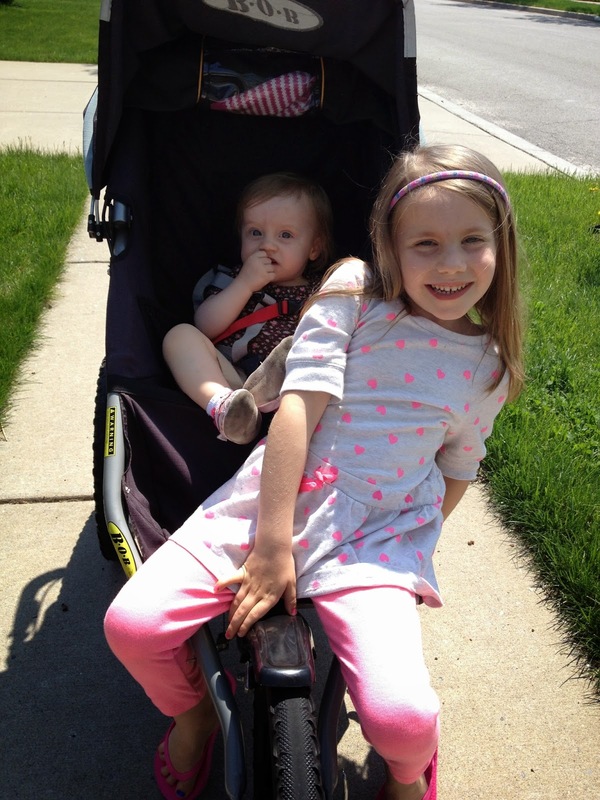 Even though I love our BOB jogging stroller I don't love to jog with it. It's a great walking stroller. It's great for the zoo. We've utilized it for family runs in the past where Scott will jog with it and I'll jog besides him...hands free! But me, I like to use my arms when I run. I like to wear headphones. And honestly, running is usually some of the only kid-free time that I have to process my thoughts or listen to loud music. So, if you see me out running with the jogging stroller you will know that I've either turned over a new leaf and am trying to add some resistance training to my schedule (not likely!) OR that life has finally gotten so hectic that it is this or nothing. On that sunny Tuesday morning I chose "this" with Ella in her dance leotard and the squawking baby in the stroller. As we plodded along I initially wondered if I was crazy. Aubrey just learned to walk and HATES to be buckled into anything for long periods of time and Ella is hit or miss on how far she's willing to ride on her bike. I also started peppering myself with a long internal battering about whether or not this actually counted as "real" exercise given that I had to stop so many times to hand the baby a piece of her teething biscuit, adjust the visor so that the sun wasn't in her eyes, and then help Ella over the cracks in the sidewalk. I finally convinced myself that "this"...this slow and lovely run with my two sweet girls...did count as exercise and that I was being far too hard on myself to think anything else at this season of life. I realized that "this" is my life right now and that there is something beautiful about that. Eventually we all settled in and though it was slow, it was a sweet run. We were going slow enough that I could actually admire the neighbors landscaping, Ella and I exchanged "wows" as we spotted pink trees and "wish" flowers (white feathery dandelions) and Aubrey even settled down for a period of time. I realized that I was being far too hard on myself to expect anything else at this season of life. The season in which I am with children, in some capacity, almost all day long. The season when my littles need me. Want me. Most of the time. And as much as I love that, and will likely miss it in just a few short years, it can get complicated, tiresome and challenging at times, if I'm honest. The season when there is not a whole lot of downtime. When the house is always a mess. When I forget my own social security number when prompted at the doctor's office. THIS is a very busy season of life with small children. It is also a very sweet and beautiful season of life if you allow yourself to embrace the chaos, be in the moments of discovery through your children's eyes and S...L...O....W down your own pace. Grocery shopping with children is...slow. Doing laundry with children next to you is....slow. Making a meal with children in the kitchen is...slow and sometimes a tad tedious. Running with children is...haha...quite slow. But, if you can allow yourself to embrace the slow and fight against your own desire to always be productive (and fast!) you will find that sometimes slow is ok. I've often seen those signs on the street, "SLOW. Children at Play." I need to hang that sign on my heart. Or more practically, on my refrigerator where I am forced to see it 47 times a day as I open the door. When you see that sign on the street you do what it says, you respect and value the children and their safety and you s-l-o-w down. Slowing down means you will cover less space in the time you have. It means you will not get quite as far. Or that you will, but not as quickly. Can we accept that? Can we be ok with that? Can we actually do that? If you've read any of my posts in the last year (which have been few and far between for all of the reasons I've listed here) you know that that has been my journey, my struggle, my goal and desire. To not keep quickly plowing through the to-dos...but be more intentional, more present, more at peace with the undone. 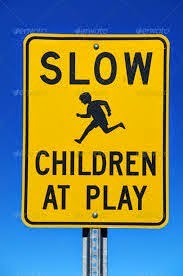 To slow down...at this season...because there are children at play. And to try to embrace the joy of it all. One awkward run with the jogging stroller at time. What a great reminder, lisa! Even for those of us past the jogging stroller stage. I've had a slow weekend with my youngest and it has been absolutely delightful. Seriously, we've had great conversations and lots of fun. Didn't know my nine year old had turned into a conversationalist! Great post, friend! I LOVE this post, Lisa. Brought laughing-crying tears to my eyes; this has definitely been my struggle as well lately. And I had one of those jogging stroller "runs" on Saturday. K kept turning around to look at me through the window in the visor: "Mom, run!" he kept saying and then, "K Mommy?" As in, are you OK? Haha. My own little cheerleeder. The metaphor is perfect. Cheers!